Russian philanthropist; born in Zhagory, government of Kovno, July 8, 1824; died at Moscow May 24, 1904. Wissotzky, whose father was a merchant of moderate means, received the usual Jewish education. He married at eighteen, and six months later left for the yeshibah at Volozhin, where he studied for a short period, settling afterward in Yanishki. At about this time the government organized a Jewish agricultural colony at Dubno, near Dvinsk, and Wissotzky became one of the colonists. The soil proving unproductive, he was obliged to return to Yanishki, where he engaged in business. His love of study, however, soon led him to Kovno, where he became a pupil of Israel Lipkin. At the end of 1854 he returned to Yanishki, and in 1858 went to Moscow, where he engaged in the tea trade; this, however, did not prevent him from taking an active interest in the affairs of the local Jewish community. He organized a Sabbath-school and Sabbath readings for the cantonists of the district, and had special meals prepared for the soldiers during Passover. He was instrumental also in restoring many a cantonist to Judaism and to his long-lost relatives. With his increasing wealth Wissotzky devoted constantly growing amounts of money to charity. He contributed 10,000 rubles to the Alliance Israélite at Paris, on condition that this sum be allowed to accumulate at compound interest for 100 years, when it would amount to 100 million francs, and that the money be then used for national purposes. Subsequently he made frequent and liberal additions to this fund, which now amounts to about half a million francs, and has become generally known as the "Wissotzky Fund." Wissotzky was an enthusiastic believer in Zionism, and one of its prime movers in Russia. When, in the eighties of the nineteenth century, the idea of Jewish colonization in Palestine began to be realized, Wissotzky spent much time and money in effecting the organization of the Chovevei Zion. He journeyed to Palestine as a delegate, and laid there the foundation for future colonization. His letters from Palestine, together with other material, were published in book form. He made generous contributions to the Palestinian organizations, and furnished practically all the money necessary for the establishment and support of the Bet ha-Sefer school in Jaffa. 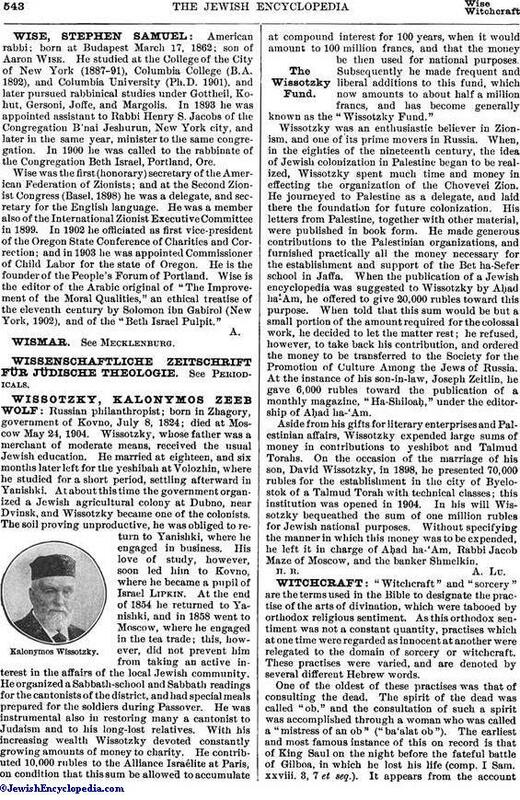 When the publication of a Jewish encyclopedia was suggested to Wissotzky by Aḥad ha'Am, he offered to give 20,000 rubles toward this purpose. When told that this sum would be but a small portion of the amount required for the colossal work, he decided to let the matter rest; he refused, however, to take back his contribution, and ordered the money to be transferred to the Society for the Promotion of Culture Among the Jews of Russia. At the instance of his son-in-law, Joseph Zeitlin, he gave 6,000 rubles toward the publication of a monthly magazine, "Ha-Shiloaḥ," under the editorship of Aḥad ha-'Am. Aside from his gifts for literary enterprises and Palestinian affairs, Wissotzky expended large sums of money in contributions to yeshibot and Talmud Torahs. On the occasion of the marriage of his son, David Wissotzky, in 1898, he presented 70,000 rubles for the establishment in the city of Byelostok of a Talmud Torah with technical classes; this institution was opened in 1904. In his will Wissotzky bequeathed the sum of one million rubles for Jewish national purposes. Without specifying the manner in which this money was to be expended, he left it in charge of Aḥad ha-'Am, Rabbi Jacob Maze of Moscow, and the banker Shmelkin.